Before departing on a week-long cross-country road trip, I had the pleasure of meeting with Jenny Bonchak. Jenny is the one-woman show behind Slingshot Coffee, bottled cold brew coffee. Jenny is committed to offering a quality, fresh product for her customers. She orders Counter Culture organic coffee and roasts it the next day. Cold brew is a method all its own; using cold water, five pounds of coffee are brewed at a time and then triple filtered. The coffee steeps over night and each type of brew has a set number of hours to sit in the cooler. Jenny explained that you are left with a concentrate coffee product after filtering the coffee grounds. This product is then bottled or cut in half with water to make the ready-to-drink product. Cold brew is about a 20 hour process from start to finish. Chef Chad from the Market Restaurant graciously allows Jenny to use his kitchen for the cold brew process when the restaurant is closed. What a great example of Raleigh business owners working together! Slingshot Coffee made its debut on May 31, and has been a huge hit offering two products, concentrate and regular coffee. Each product comes in a 16 ounce bottle. The regular coffee has a red and white label and is ready to drink. The concentrate coffee has a teal and black label and offers four to five servings. The concentrate can be mixed with water, milk and even beer! When Bottle Revolution in Raleigh has a stout on tap they mix about 10 ounces of concentrate Slingshot Coffee with the beer. Coffee and beer, what could be better? Jenny brews, labels and packages all of her products by hand. She then handwrites each Slingshot Coffee product&apos;s "brewed on" date and "coffee origin." You can obviously tell how much Jenny cares about her cold brew! 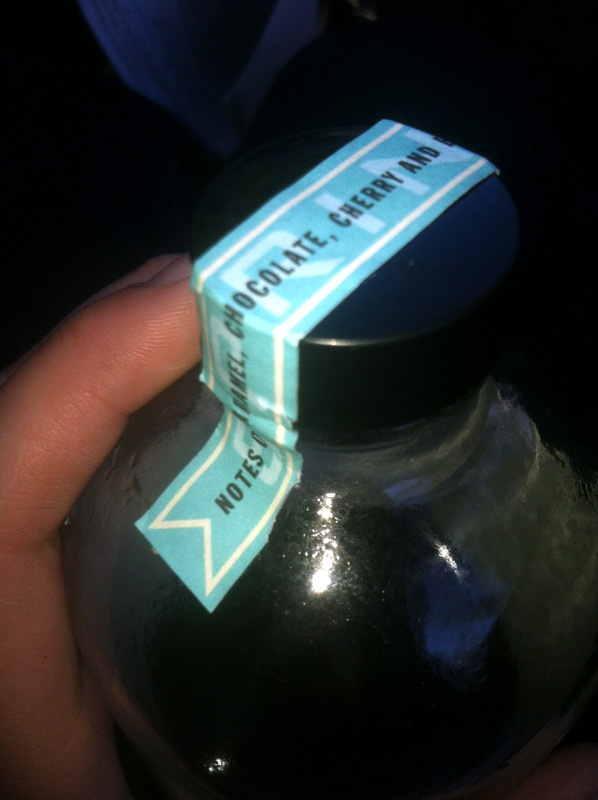 My favorite part about each Slingshot Coffee product is the tasting notes label on top of the bottle. Jenny grew up on a 300 acre vegetable farm in Pennsylvania where she learned about the importance of seasonality. Jenny hopes that Slingshot Coffee will teach people about the seasonality of coffee. The tasting notes labels are different for each bottle depending on the season and coffee origin. For instance, I tried the concentrate coffee from Colombia. The tasting notes included caramel, chocolate, cherry and a bit of citrus. Everyone has a different palate and I could taste the caramel and chocolate notes the most. It&apos;s wonderful to be able to drink a coffee product without adding sugar and artificial flavors. Slingshot Coffee is already so flavorful and it&apos;s amazing to me that only two ingredients are used, City of Oaks water and coffee! 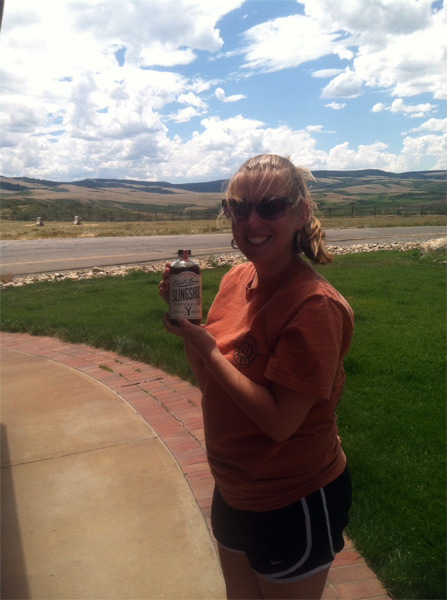 Check it out, Slingshot Coffee made it all the way to the windy state of Wyoming on my road trip! I know what you&apos;re thinking now, where can you buy this fabulous product? Slingshot Coffee is currently available for purchase at Escazu, Bottle Revolution, Tasty Beverage, the Market Restaurant, and Jubala Village Coffee. Jenny is expanding her company to Durham and hopes to find more retail outlets in the Greater Raleigh area. Pick up a bottle of Slingshot Coffee next time you&apos;re out. 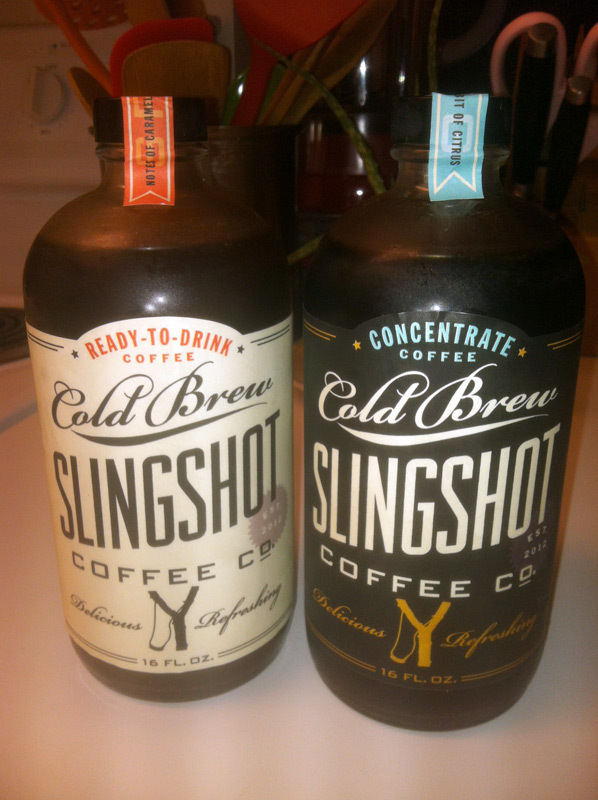 Actually, pick up a few bottles because I know you are going to love Slingshot Coffee!